A few weeks ago I was working out some control issues for the field crews. I was using a drawing from a team whose template origin may have deviated from the standard, or been converted from an older version of Civil 3D. I ran into a similar circumstance today doing the same operations with the same originating team. Clearly there is a pattern. 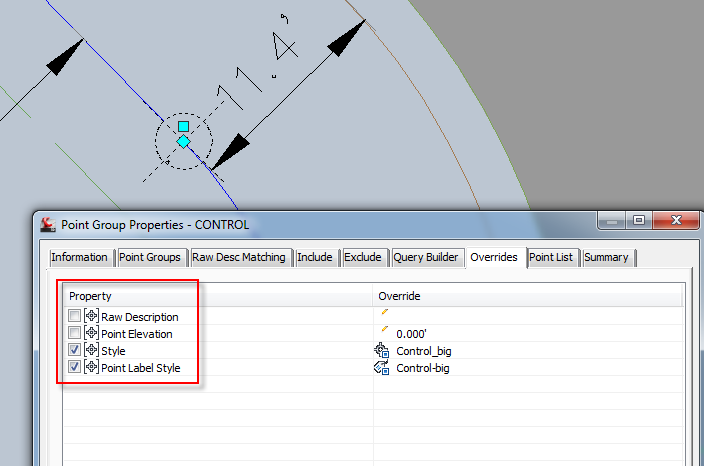 The issue is that many Civil 3D Points will not display their labels. In the image below, notice that I have overridden my controlling Point Group, here called ‘Control’, so that the Point and Label styles will change to appear like the rest of the control points. The problem is that it isn’t working. I have been through every aspect of investigation, display layer, point edit, audit, and even purge registered definitions too. These Points will just not play fair. There are so many blog posts to keep up with that sometimes you think you read something but can never find it when you are looking for it. This happened recently in a class where I was teaching those who put as-builts together using AutoCAD Civil 3D 2013. 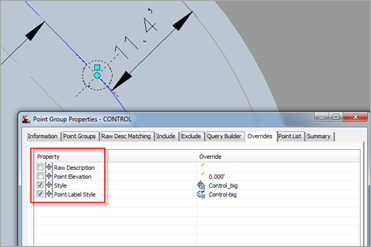 I thought I had read in a blog post awhile back that AutoCAD 2013 has a new feature where you can ‘strike-through’ (example) text. This would be instrumental to those doing as-builts. However, when we placed some Mtext in and the Mtext contextual tab came up, there was no such option. No worries, I will just bring up the properties palette but the option is not there either. Corridor daylight slopes are very easy…unless you need to transition from 1:1 to 5:1 over a station range. It can be done, but it’s a little tricky. Find out how after the jump. The more classes I teach, the more I see constant confusion regarding how Civil 3D objects and styles use AutoCAD layers. What is even more surprising is that it doesn’t seem to matter if I am teaching a basics class or an advanced class. Thus I have added a link to a document that explains this in more detail. Let me know what you think! As many of you may have heard through the #Civil3D grapevine, Civil4d.com is under new management. With new management comes the same great content with an eye to the future. Autodesk keeps improving the AutoCAD Civil 3D software so as users there is always something new for us to learn. You may have already noticed the change in theme to the blog. We are also working behind the scenes to bring you some stronger categories and tags to help you find the content you are looking for. In it’s infancy this blog was civil3d.com but we have since added the 4th dimension, and with that the possibility for new content. While we are hoping to keep this blog as one of the leading resources for your Civil 3D knowledge we are also hoping to provide you with other pertanent information for an AEC workplace. Are you interested in contributing? Do you have some ideas of what you want to see? Drop us an email at admin@ this domain or leave us a comment.